Daring Young Mom: "Drops of Awesome"
I think some of you might be refreshed and strengthened by reading "Drops of Awesome" from the Daring Young Mom blog of Kathryn Thompson in Seattle. If you tend to discredit the good that you do and focus on your failings, or if you are painfully aware of how often you fall short of your potential in spite of sincere efforts to do good and follow God, this post might help you see things in a new light. Salt Lake City's This Is the Place Heritage Park just concluded their 2012 Candlelight Christmas. I was able to attend on Friday night while briefly visiting relatives here in Utah. Visiting the exhibits in the pioneer village was surprisingly interesting in spite of the cold. The biggest surprise to me was the beautiful nativity scene in a real barn with real animals and real smells, with real parents and a baby boy. The setting and the beautiful music being played created a sense of reverence and sacredness that I found refreshing and uplifting. So simple but so beautiful. Other highlights for me included the dancing (a simplified Virginia reel dance) that our group got to participate in. I also really enjoyed the Christmas carolers outside, the hot chocolate inside the Huntsman Hotel, and the exhibition featuring the mountain man showing us how pioneers and outdoorsmen of the day survived. Thank you to the many volunteers who support this annual event. I hope I can return from China again next year and visit this special place once more. This softbound volume has some hard-hitting information with good documentation. In the course of this book, Dr. Miller explores candidates for what the Book of Mormon calls elephants, cureloms, cumoms, and, of courses, horses. He observes that the latest dated remains of a species need not correspond with the actual extinction date, since pockets of the animals may have survived for centuries or thousands of years without leaving remains that we have found so far. Dr. Miller proposes that the "elephants" mentioned in the ancient Book of Ether (Ether 9:19) could have been the Columbian mammoth. Based on the research he has done in Mexico, it is the most numerous of late Pleistocene fossils in some area. Evidence from many sources confirms that humans interacted with mammoths in North America. As early as 1952, one scientist concluded that, "There can no longer be any reasonable doubt that man and elephant coexisted in America." (L.H. Johnson, "Men and Elephants in America," Scientific Monthly, 75 (1952): 215-221.) Many more finds since that time confirm that humans associated with mammoths, and increasing evidence points to the survival of some mammoths in some regions past the end of the Pleistocene, with dates later than 3,000 B.C. reported by one source. An even later report of about 2,000 years ago in Florida is interesting, but other scientists feel that the Florida data is invalid. Miller then proposes that small scattered populations of horses and asses, especially in remote areas, could have survived until shortly before they were reintroduced by the Spaniards. This hypothesis is based in part on some recent Carbon-14 measurements, mostly unpublished, from work tied to a controversial former physics professor at BYU, Dr. Steven E. Jones (Jones is controversial to some people for his conclusions about 9-11 based on his interpretation of the physics of the building collapse that led him to conclude that the factors beyond jet fuel fires and airplane impact must have been at play to bring the buildings down). However, Miller does not appear to be merely relying on Steve Jones alone, but says, "I later worked with him on these" (p. 82). I have some more exploring to do in sorting through the evidence cited by Miller, but feel like the case for actual horses in the Book of Mormon (as opposed to, say, tasty tapir flocks) may be stronger that I previously supposed, though it's a gift horse that we should look squarely in the mouth. Evidence for late pockets of actual horses won't resolve a variety of other questions that can then be asked, but certainly the challenge to the Book of Mormon has become much different than it was in Joseph's day, when it wasn't yet even known that horses (as well as elephants) had been on the continent anciently. After all, if Joseph were fabricating the Book of Mormon based on what was known in his day, why mention ancient horses at all when they were widely understood to have been introduced recently by Europeans coming to the New World? Why take the risk of mentioning them in Jaredite times and beyond? I especially look forward to more published information on the radiocarbon dating results that he and Steven Jones have worked on. I also look forward to further finds that will might us understand these issues more accurately. Finally, on Christmas day, I also ran into this interesting video from one of the authors of the LDS Guide to the Yucatan, with some other information relevant to the horse in the Americas. Interesting. A Most Remarkable Book: Evidence for the Divine Authenticity of the Book of Abraham, written and directed by Tyler Livingston, is a professionally produced DVD from the Foundation for Apologetic Information and Research (FAIR) that will surprise and impress many people interested in some of the complex issues related to the Book of Abraham. While the Book of Abraham has been a favorite “weak spot” of Mormonism for critics to attack, in the past few years substantial breakthroughs in our knowledge of the ancient world have resulted in a large body of evidence actually supporting the divine authenticity of that book as an ancient work that Joseph Smith could not have fabricated based on what was known in his day. A Most Remarkable Book helps us understand critical issues in the Book of Mormon, both in terms of refuting popular attacks and revealing exciting lines of thought based on outstanding scholarship that help us appreciate the Book of Abraham. David Bokovoy holds a BA in History and Near Eastern studies from Brigham Young University and an MA in Ancient Near Eastern and Judaic Studies from Brandeis University where he is currently a doctoral candidate in Hebrew Bible and the Ancient Near East. David is an LDS Institute instructor at the Boston Institute of Religion and a CES Field writer for Institute curriculum. He is a five-time recipient of the Hugh Nibley Fellowship from the Neil A. Maxwell Institute for Religious Studies. David has published articles in a variety of journals and books including BYU Studies, the Journal of Book of Mormon Studies, FARMS Insights, and the FARMS Review. He is the co-author of the book Testaments: Links Between the Book of Mormon and the Hebrew Bible. I wish that kind of information were provided for each speaker. The evidences presented in the video go far beyond the few nuggets currently listed at FAIRLDS’s own Evidence for the antiquity of Joseph's Book of Abraham, and significantly strengthen some of the arguments that I have summarized in my related pages such as my LDSFAQ page on Book of Abraham Evidences from Ancient Texts and my LDSFAQ page on evidences from the Facsimiles and the text. (Also see "Book of Abraham 201: Papyri, Revelation, and Modern Egyptology" by Michael Ash, which is a good review of some common issues and also some interesting evidences for the authenticity of the text.) I feel the evidences on the video are presented fairly and articulately, and are worth reflection and further study by interested viewers. In my opinion, the evidences in favor of the Book of Abraham might be even harder to brush off than some of the evidences for the Book of Mormon. Because so little was known about ancient Egypt among the scholars of Joseph’s day, the Book of Abraham cannot be explained away with an appeal to secret partnerships with Solomon Spaulding or other highly educated friends, or to imagined access to university libraries or hypothetical vast frontier libraries teaming with the latest scholarly works from all over the world. So when we find remarkably accurate or plausible statements about the ancient world, such as the crocodile being not just an Egyptian god but also specifically “the god of Pharaoh,” or the animal headed figures in Facs. 2 being said to represent the “four quarters of the earth,” or the person on the altar being said to be praying to God when in fact the position of the hands and feet create the Egyptian glyph for supplication or prayer, or when “the god Elkenah” is shown to make a great deal of sense when plausibly interpreted as the god El of the Canaanites, then for these and many more interesting “bulls eyes” from Joseph Smith, we are left with nothing but blind luck as the only secular explanation. But after viewing the video, I hope viewers might wonder of more than dumb luck is involved. Turning to details of the content of the video, it begins with a brief review of the origins of the Book of Abraham and quickly gets into the most common attack against it, namely, the claim that the tiny group of fragments found in 1967 is the original text Joseph was attempting to translate, and now that we can read Egyptian, we see that it has nothing to do with the Book of Abraham. The response to this involves an appeal to the other scrolls that were part of the original collection, and the fact that the recovered fragments do not match the long scroll that Joseph had identified as the Book of Abraham. The length of the scroll is important here. A variety of peripheral related issues are touched upon, such as the tendency for Egyptian scrolls to have seemingly unrelated documents on the back and the calculation for the length of the original scroll giving an estimate of 40-44 feet. Other arguments treated include the claim that Joseph said the scroll was crafted by the hand of Abraham, when it obviously is much later. Of course, the statement that the text was written “by his own hand” does not mean that Abraham physically prepared the copy that we have. Further, “by his own hand upon papyrus” in Joseph’s translation is actually attested in another Egyptian text where it need not mean anything more than authorship. Further, a Hebrew idiom beyadh meaning “by his own hand” means “by the authority of” and could simply mean that the original Semitic text was prepared under the direction of Abraham. In any case, when copied over and over through the centuries, that phrase indicating the authorship or the authority behind the document would be copied again. The Bonus Features section also explores the argument that Facs. 1 was drawn incorrectly. The meat of the video, though, is not in refuting popular attacks, but in exploring the evidences for plausibility of Joseph’s translation. The video covers evidences from the facsimiles and the text itself. Other topics covered include the heliocentric model of the Book of Abraham, some specific names and terms in the translated text, the ancient Near Eastern concept of the Council of the Gods (or Divine Council), and the relationship of the Book of Abraham to other ancient texts such as the Apocalypse of Abraham, a ancient pseudepigraphic work with strong correlations to the Book of Abraham. This text was not available to Joseph Smith and was not yet translated to English in Joseph’s day. The abundance of ancient texts providing remarkable correlation to Book of Abraham material is the topic of one of the most impressive scholarly works on the Book of Abraham, Traditions about the Early Life of Abraham, edited by John A. Tvedtnes, Brian M. Hauglid, and John Gee (Provo, Utah: Foundation for Ancient Research and Mormon Studies, 2001). The central figure in Facs. 2 and its Egyptian role in representing the center of creation, as Joseph identified it. Also relevant and interesting is the relationship between the word “Kolob” and words meaning “near” and “center,” fitting Joseph’s description. A bird as angel of the Lord in Facs. 1. Figures 5-8 in Facs. 1: these were actual gods worshipped in the Near East. Indeed, there is evidence for the plausibility of the actual, specific names given in the Book of Abraham. Elkanah, or El, the principal god of the Canaanites, could well be associated with human sacrifice. The crocodile as the god of Pharoah, has strong evidence in favor of Joseph Smith. The crocodile god Soebek was not only an ancient Egyptian god, but the god of Pharoah, exactly as Joseph said. “The king appears as the crocodile god Soebex” is from one of the Pyramid texts. The lotus flower, an Egyptian symbol for a foreigner, a good way to describe Abraham, as Joseph said of the lotus flower in Facs. 1. The pillars of heaven identified by Joseph. Abraham as a substitute for Osiris, attested in several texts. There is also a brief discussion of the “J-Red” theory of Kevin Barney, which suggests that to understand the Book of Abraham, turning to Egyptologists alone will not suffice. Instead, we should consider how a Jewish redactor might view Egyptian elements through a Hebrew lens. So while we can certainly say that some of Joseph’s interpretations are correct based on how Egyptologists now view these things, if we look at the documents in light of how a Jewish redactor might have understood it, we may find many more things that are right. While Abraham’s map of the cosmos is interesting in light of the ancient geocentric model (stars nearest god, different revolution times or “set times” for different tiers, etc. ), something which would be utterly foreign to Joseph, David Bokovoy explains that it becomes even more astounding when we understand the imagery that is deliberately used to invoke themes from the Council of Gods theme in the ancient Near Eastern perspective. David explains that stars are linked with human beings and the heavenly host, and in bis view the imagery used with Kolob identifies it with Jesus Christ – the Being who is nearest God. An interesting segment! It is interesting that the text of the Book of Abraham presents us a picture that even ten years ago, Egyptologists would have thought that that doesn’t fit with what we know of ancient Egypt. But now we see that it is a perfect fit. It weds together abolsutely perfectly with what we find in Egyptian history. The key is that no one had ever sat down and looked at it carefully. If we do the Egyptology correctly, it supports what we find in the Book of Abraham. I know people who left the Church over the apparent weakness of the Book of Abraham. I wish they had been a little more patient, because now we have the luxury of not only having some good answers to at least a few of the most common attacks on the Book of Abraham, we also have some compelling evidence to argue for the divine authenticity of this remarkable book. Faith and patience is still required, and we should never expect to be able to "prove" the Gospel based on evidences. But we can strengthen faith and help overcome attacks on faith with a growing body of evidence that something besides fraud and dumb luck is involved in the Book of Abraham, though some puzzles and problems certainly remain. Kudos to Tyler Livingston and his team for this excellent video. Length is slightly over 1 hour. Cost is $13 at FAIRLDS. Highly recommended! ‎I remain a steadfast member of the Mormon Church because, for the first time in my life, I understand why it is not a curse to be born a woman, and how it can be said with a straight face that men and women stand before God and before each other as true equals. I understand now that women are that they might have joy (2 Ne 2:25). I'm grateful for her voice and the many contributions she has made to the world in her journey. Hat tip to David Grant. Book of Mormon defenders and enthusiasts have a lot to be excited about. From the discovery of carefully crafted chiasmus in the Book of Mormon to the discovery of intricate details in the Arabian Peninsula that add plausibility and insight to First Nephi, the march of time has resulted in many advances in our appreciation of the Book of Mormon as an ancient text. That enthusiasm sometimes gets out of hand as Mormons sometimes fail to remember just how much faith is still required to accept the Book of Mormon (or the Bible). Regarding the mention of "horse" in the Book of Mormon, it's fair to recognize that we have a genuine trouble spot. In light of some glimpses of possible evidence pointing to late pockets of horses that survived long past the generally assumed New World horse extinction date of around 11,000 B.C. into pre-Columbian times, some LDS folks argue that there is no serious problem with accepting mentions of "horses" in the Book of Mormon as genuine horses as opposed to perhaps some other species. Unfortunately, the scant evidence that is often cited has some problems. Some finds of bones or teeth in the Yucatan in recent layers may have been due to disturbances from digging caused by animals or humans, or may have been curious humans transported from other locations. There is no clear evidence of horses being present among the early Mayans, for example. There remains the possibility that horses persisted much later than the last ancient bones that have been found. Finding remnants is a rare thing, especially when they need to be found by someone able and willing to recognizing their importance and pay for the testing needed. Intriguing evidence that groups of horses may have persisted much later than the apparent extinction date comes from recent analysis of DNA preserved deep in permafrost in Alaska. See "Mammoths Hung On Longer? Late-Surviving Megafauna Exposed by Ancient DNA in Frozen Soil" (American Museum of Natural History, Dec. 15, 2009, ScienceDaily, accessed December 15, 2012). This is far from Book of Mormon territory, but it makes a relevant point. Researchers examining the soil and its DNA fragments found fairly clear evidence that horses were present in the New World as much as 5,000 years later than previously assumed. Moving the extinction date from 11,000 B.C. to 6,000 B.C. in this initial forensic effort doesn't solve the puzzle for the Book of Mormon, but if we can have that big of a surprise in Alaska, could there be even later dates that will surprise us in Mesoamerica? Well, maybe, and maybe not. This issue is far from a slam dunk for the Book of Mormon and still needs to be considered a genuine issue for further research. I wish I could report that Mesoamerican documents have now been unearthed that confirm the existence of pre-Columbian horses, and, while we are at it, Nephites. Give us some slam dunk evidence to end the debate and convert the critics, eh? There is abundant evidence to strengthen the case for plausibility, or rather, to strengthen faith once exercised or to overcome some common objections that might be total roadblocks to faith. But I actually think it would frustrate the nature of faith and religion and God's desires for us if we could simply take Michael Coe or any other top scholar to a site in Mesoamerica, point to a carved monument, and say, "See? This city was named Zarahemla, its people were named Nephites, its enemies were called Lamanites, the worshipped the Messiah named Jesus, and here is the entire text of Mosiah 2 and 3 Nephi 12 inscribed on this wall from 75 A.D. So when would you like to be baptized? We've got an open slot on Tuesday night, right after we finish the mass baptisms of that tour group from Harvard." But when everything is that crystal clear, it might just be too a little too late. In our zeal to overcome objections and point to evidence for plausibility, we sometimes need to add a little skeptical "neigh, neigh" to our "yay, yay." Yay for the evidences that are authentic, but a firm nay when the evidence proves to be completely worthless or occasionally, even fraudulent. That appears to be the case with a commonly cited bit of pro-horse evidence from Wisconsin, where a horse skull was found in a pre-Columbian mound. It's in many books and some of these are cited by Mormon defenders who probably haven't yet learned the humorous story behind that skull. The story of a prank. See "There Were No Ancient Vikings in Wisconsin? Prank at Spencer Lake Mounds" by K. Kris Hirs at About.com. Some of us were pretty intrigued when we first heard of this find. But there is compelling and credible evidence from a reliable source that the skull was planted there as a prank. Radiocarbon dating apparently confirms that. Kiss that evidence good-bye, folks. That's definitely a neigh, neigh sound I'm hearing. One of Shanghai's finest LDS young single adults composed and performed this song, "I'll Wait" by Blythe Bailey. I think some of you might like it as much as we did. We first heard this song in Nanjing at a talent show, and then again this morning on iTunes (happy to have paid 99 cents for this!). We're so glad we got to know Blythe here in China. The calling my wife and I have as District Co-Chairs for the Young Single Adults Committee (Shanghai International District, with branches in Nanjing, Shanghai, Suzhou and Hangzhou) is the best calling ever. We get to meet, learn from, and sometimes even feed or otherwise help some of the most interesting and inspiring people in the Church. We also heard her sing something else last night with one of the choirs at our hugely successful Christmas Open House in Shanghai, where about 500 people came, with perhaps roughly 200 being non-LDS visitors. It will be even bigger next year, but Blythe, unfortunately for us, is heading back to the U.S soon. We'll miss her! You can listen to it on YouTube but the recording on iTunes is better--and worth it! Gift suggestion: If you know anybody waiting for a missionary, or about to wait, this could be especially meaningful. Or someone waiting for their overseas soldier to return. On iTunes, just search for Blythe Bailey. Oh, and there's also her song, "What If?" Yeah, I bought that one, too. Nice! Liberated? As in, Liberated Lungs? "An Ancient Prejudice Has Been Removed!" and now women can can take off the chains that kept them captive. Liberated at last, now women, too, can enjoy the many benefits of, uh, smoking, proclaims the cigarette add in this classic and instructive Lucky Strike ad from 1929, preserved at TobaccoDocuments.org. An Ancient Prejudice Has Been Removed. Today, legally, politically and socially, womanhood stands in her true light. AMERICAN INTELLIGENCE has cast aside the ancient prejudice that held her to be inferior. "TOASTING DID IT"-- Gone is that ancient prejudice against cigarettes -- Progress has been made. We removed the prejudice against cigarettes when we removed from the tobaccos harmful corrosive ACRIDS (pungent irritants) which are present in cigarettes manufactured in the old-fashioned way. Thus "TOASTING" has destroyed that ancient prejudice against cigarette smoking by men and by women. "It's toasted" No Throat Irritation-No Cough. Then look at the 1833 revelation known as the "Word of Wisdom" recorded in Doctrine & Covenants 89, where we learn, prophetically, that tobacco is not for man and should be avoided as a key part of the Lord's health guidance for mankind. Conspiring men in the last days just here apparently includes the clever marketers of tobacco, alcohol, and other harmful drugs. Liberation through a smoking addiction? But powerfully marketed, it has sold and continues to sell and destroy the lives of those who become "liberated." I'm especially sensitive to this issue in China, where 1 out of 3 of the world's cigarettes are smoked by Chinese men, with a little help from some excessively liberated Chinese women. The sound of hacking and snorting on the streets of China from smokers (mostly) is one of the few truly unpleasant things I have to deal with in this beautiful country. The fruits of smoking are ugly, stinky, debilitating and deadly, yet so much money continues to be spent to market this pestilence. Jordan Goodman, the author of Tobacco in History, says that as a historian he is careful about pointing the finger at individuals, "but in the history of tobacco I feel much more confident saying that James Buchanan Duke - otherwise known as Buck Duke - was responsible for the 20th Century phenomenon known as the cigarette." "The problem was he produced more cigarettes than he could sell," says Goodman. "He had to work out how to capture this market." The answer was to be found in advertising and marketing. Duke sponsored races, gave his cigarettes out for free at beauty contests and placed ads in the new "glossies" - the first magazines. He also recognised that the inclusion of collectable cigarette cards was as important as getting the product right. In 1889 alone, he spent $800,000 on marketing (about $25m in today's money). We now know that cigarettes are far more addictive than cigars. The fact that the smoke is inhaled - which it is not traditional for cigars - also makes them more dangerous. But a correlation with lung cancer was not made until the 1930s and the causal link was not established until 1957 in the UK and 1964 in the US. Cigarettes were in fact promoted as beneficial for health. They were listed in pharmaceutical encyclopaedias until 1906 and prescribed by doctors for coughs, colds and tuberculosis (a disease which the World Health Organization now links with tobacco). There was an anti-cigarette movement in the early 1900s, but it was more concerned with morality than health. A rise in smoking among women and children fed into a wider concern about the moral decline of society. Cigarettes were prohibited in 16 different US states between 1890 and 1927. Duke's gaze shifted overseas. In 1902 he formed British American Tobacco with his transatlantic rival, Imperial Tobacco. The packaging and marketing would be tweaked for different consumers but the cigarettes would remain largely the same. More than a decade before the creation of the Model T Ford, Duke had a universal product. "To him every cigarette was the same," says Goodman. "All of the globalisation that we are now familiar with through McDonald's and Starbucks - all of that was preceded by Duke and the cigarette." The global reach of cigarettes is still extending today. Although smoking in wealthy parts of the world is in decline, cigarette demand in developing countries is increasing by 3.4% a year, leading to an overall growth in cigarette consumption. Kremer also reports that "Buck Duke is said to have marched up to a map of the world and planted a finger on China, saying: 'This is where we're going to build our empire!'" And so Big Tobacco has indeed. Tragic. Dr Robert K Jackler of Stanford University Medical School explains how women were persuaded to smoke in the early 20th Century. The industry had a problem. You can't advertise your way into convincing women to smoke - you have to change cultural expectations. A woman smoking on a street corner was a signature of prostitution. A polite woman would never be caught smoking in public. Edward Bernays - who was actually Sigmund Freud's family member - was engaged by the American Tobacco Company to work out a public relations strategy to enable women to smoke. So in the late 1920s, for example, they hired a bunch of young women to march down Fifth Avenue in the Easter Parade, holding their "torches of freedom" - their cigarettes. And this then became a symbol of women's emancipation. Great swelling words and symbols of vanity, promising liberty, but leading into captivity, addiction, and corrupted lungs. How liberated are your lungs now? 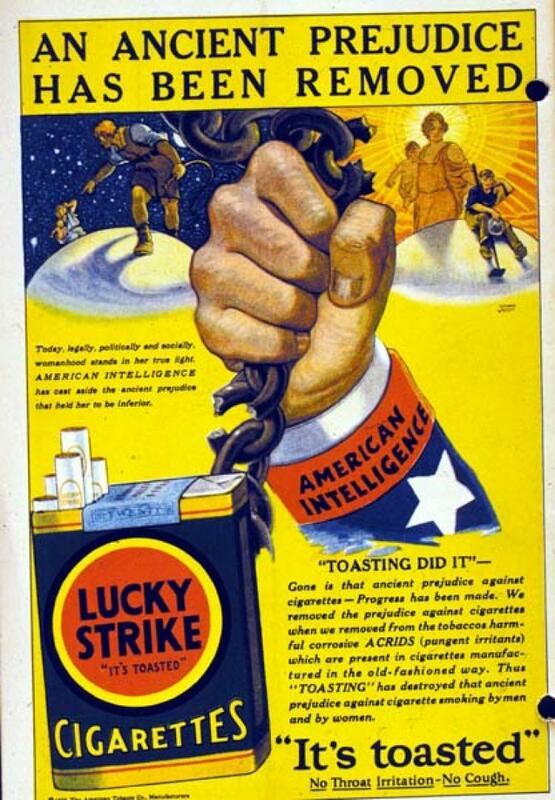 Or are they, perhaps, as the Lucky Strike ad says, toasted? The bogus liberty promised to women and men by clever marketers and conspiring men is not limited to tobacco products. I will leave it as an exercise for the reader to find and share instructive parallels.